On her 26th Birthday, Mrs. John Molina receives her colorful Birthday cake. 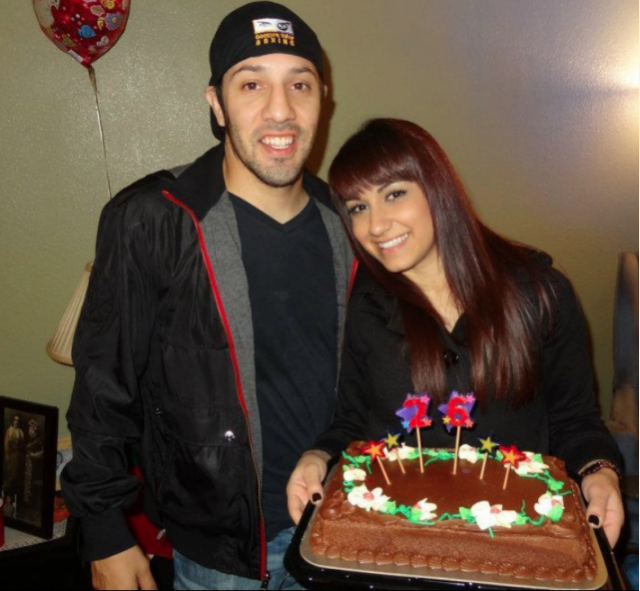 There was no way her man was going to lose a fight on her Birthday – no way. Like a movie actor, the 34-year-old John Molina Jr. seems to be following this “made for the movies” script. Hopefully, that script will have a happy ending and Molina and his wife will hear their names mentioned when the screen actors guild announces – Best Picture of the Year. The signs are there: Molina has already run up steps of the Philadelphia Art Museum just like Rocky, he’s dressed up like Jessie James and he’s now wearing boxing trunks displaying a comic book superhero. In how many of John Molina Jr’s do or die fights, have we seen him rise up from the canvas? On Friday evening, December 15, 2017, at the Pioneer Event Center in Lancaster, Calif., it happened again. After being knocked down in round two, there was Molina in round four getting back on his feet to send the Ukrainian Ivan Redkach (20-4-1, 16 KOs) into dreamland. Over a nine-year professional career, John Molina (30-7, 24 KOs) has often shown us his incredible resolve to not only finish out a fight but win it. 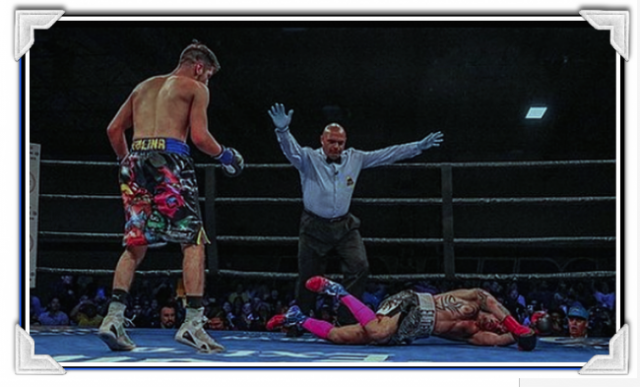 Molina sure needed that extra something versus the Ukrainian Ivan Redkach on Friday night. In the early stages of their fight, Redkach was almost always beating Molina to the punch. The lefty’s long, quick hands couldn’t miss their target as he kept tattooing Molina with one hard blow after another. In round two Redkach backed Molina into the corner and let him have it. Two big rights then a left landed on Molina’s chin to send the Covina, Calif. fighter to the canvas. As has been his MO (modus operandi), Molina got back up quickly, even though his legs were wobbly. His only means of survival? Keep firing back to reach the end of that round. Molina, who has come back from the brink of defeat on so many occasions, began round three like someone who was looking for revenge. At that point, he started swinging for the fences but he was missing. Again, as he has done on so many occasions, he knew that one of these hard blows would eventually land and one finally did. With under a minute left in the round, Molina let go with his “Sunday Punch” while Redkach was languishing on the ropes. 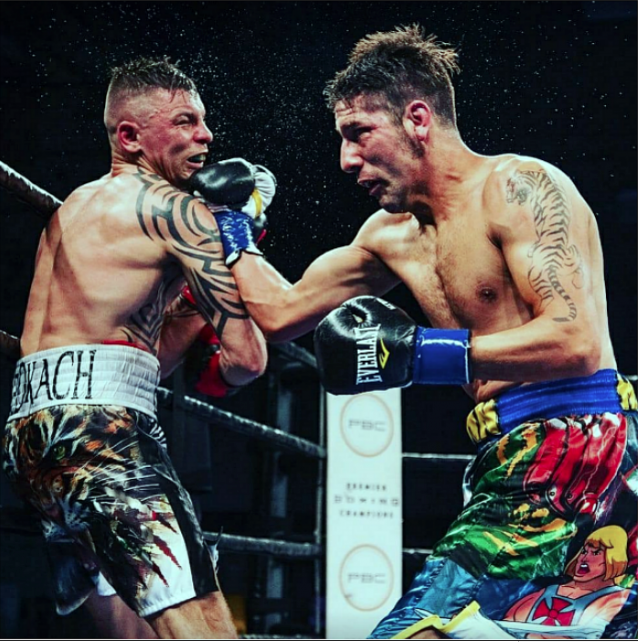 The blow sent Redkach and his mouthpiece crashing to the canvas and like his counterpart, the 31-year-old Redkach got back up on his feet. Molina then tried to end his night, but the gutsy Redkach survived the round. In round four, Molina again went after Redkach and again got caught by a left. Molina responded with a hard shot to Redkach’s midsection. ‘Defense’ appeared to be an out of sight, out of mind consideration from here on out. After Molina popped Redkach with two solid rights, Redkach shook his head as if he wasn’t hurt. But Molina knew better and let fly with two more solid rights to send Redkach stumbling back to the canvas. The referee, Edward Hernandez Sr., took one look at the fallen Redkach and waved off the contest. So, once again, John Molina Jr. defeats a fellow slugger and puts on a terrific, gutsy performance. Is he the best ever? No! 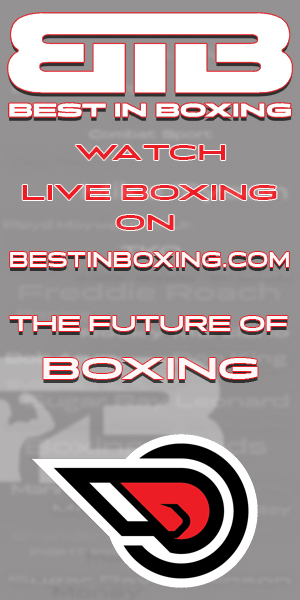 But the boxing greats who have managed to defeat Molina, have given him high praise. Molina’s toughest opponents were those with the most sound and technical fighting style, a plan that could not be altered – like the Martin Honorio performance in 2009 that we witnessed at the Pechanga Resort & Casino in nearby Temecula, Calif., the Antonio Demarco win in 2012, the Lucas Matthysse’s win in 2014 and finally Terrence Crawford’s big win in 2016. They would all agree, there is no margin for error when you face tough guy John Molina Jr.